Looking for the Wednesday Wandering? Page back one and hop on the carousel with me. Then come back and join me and Alan as we venture into the mists of Mythic Wales. JANE: Last week we began what I suspect will be an extensive journey into a sub-section of Fantasy fiction. After all, it’s an area both of us like a lot: Fantasy that is firmly based within the framework of actual history and mythology. One of my favorite series in this area are the four books written by Evangeline Walton, based on the Welsh Mabinogion. The source material is available in many translations. 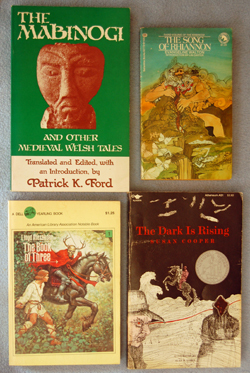 (See the introduction to The Mabinogi by Patrick K. Ford if you’ve interested in some of these.) So what do these novels have to offer? Just that… They are novels. The characters are well-realized and three dimensional. The dialogue is lively and spritely. The author provides expansion of detail that makes the basic story flow more easily. And she manages to do this without losing the mythic sense of magic and mystery, so that it lingers in the reader’s mind even after the book is closed. ALAN: I met Evangeline Walton very briefly at some convention or other many years ago (sorry, I can’t give chapter or verse). I recall her as a very bubbly and effervescent person, quite charming. She stood out in a crowd because her skin was blue – initially I thought this was make up (it was a convention after all), but later I discovered that as a child she had been treated with tincture of silver nitrate for severe sinus infections and her skin had absorbed the colloidal silver and irreversibly darkened on exposure to light. Apparently, that’s quite a common side effect – it’s called argyria – and it’s one of the many reasons why the treatment has fallen out of favour. JANE: That’s amazing. Blue skin somehow seems to fit in with a writer who so effortlessly wrote her way into a mythic realm. I know which version would hook me… Yet Walton is faithful enough to her source material that one can read for pleasure and come away with an accidental education. ALAN: I’ve not read Walton’s books, but I have come across the Welsh myths elsewhere. When I married my first wife we merged our libraries, as one does, and I discovered that she had a series of books by Lloyd Alexander. They are known as the Chronicles of Prydain and they take much of their inspiration from the same sources that Evangeline Walton drew on. I also found the books to be quite funny in places. It’s not many stories that have a pig-keeper as a hero! JANE: I liked the Prydain books very much and for many of the same reasons you did. I love the characters with all my heart and consider them friends. If I have one “complaint,” it’s that – perhaps as is fitting for their audience – the myth-based characters are more black and white than they are in “reality.” Well, at least in their original mythic source material. I do have a bad tendency to think of this as somehow “real.” I have been teased about that, but I guess I just can’t forget that what we call “myth” was once someone’s religion. Another author who used the Welsh material creatively was Alan Garner in his novel The Owl Service. It’s a dark and creepy book, and not as much to my taste as his The Weirdstone of Brisingamen (which is Norse-based), but it is still a good book. It’s also a fine example of how mythology can be used as a firm basis for a novel without becoming locked into simply re-telling. ALAN: Garner was really good at this. As you point out, he used the Norse myths in The Weirdstone of Brisingamen and it was astonishing just how well he integrated them into the story. JANE: Oh, dear lord… My reading shelf just grew longer. I’ve got to find that one and re-read the others! While we’re on the topic, we can’t leave out Fantasy based on Arthurian fiction. We’ve discussed this elsewhere in our tangent of May 24th, 2012 (TT: Tolkien Whine), so I’ll just say that when I like Arthurian based fiction best is when it expands on the source material – much as I discussed Evangeline Walton doing with the Welsh Mabinogi – not when it retells the source in a completely predictable fashion. A good example of this is Susan Cooper’s wonderful “Dark is Rising” series (first book, Over Sea, Under Stone) which uses motifs from Arthurian mythology with respectful fidelity, but has its own story to tell. ALAN: I can’t leave this discussion without mentioning Henry Treece. He seems largely forgotten now, but in the 1950s he published a loosely linked tetralogy which explored the history of Britain from Neolithic times to the end of the Arthurian period. Although these were nominally historical novels, they were so infused with myth and mysticism and the so-called “Matter of Britain” that they can easily be read as fantasies. They were particular favourites of Michael Moorcock, and when they were republished in the 1970s, he wrote very enthusiastic introductions to the books. JANE: Those sound good, too. I think that trying to write fiction about a historical period without including the religious beliefs that were part of the people’s lives leads to a certain flatness. I’ve been thinking… Although there are authors who become closely involved with one period of history or one type of myth, there are those who delight in poking their toes into a wide variety of pools – and sometimes blending different traditions in very interesting ways. However, the time has come for me to get to work, and I know I could get distracted for hours and hours. Let’s come back to this next time. This entry was posted on May 2, 2013 at 1:00 am and is filed under Thursday Tangents. You can follow any responses to this entry through the RSS 2.0 feed. You can leave a response, or trackback from your own site. I’m still back at the description of Evangeline Walton. How perfect! The books are great, too!